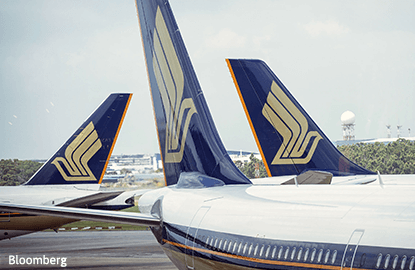 SINGAPORE (Nov 3): Singapore Airlines reported a 70% fall in 2Q earnings to S$64.9 million as excess capacity and aggressive pricing by competitors depressed yields. Group operating profit declined 15.5% to S$109 million as the 4.7% fall in expenditure was insufficient to cushion the S$194.5 million or 5.3% reduction in revenue to S$3.65 billion for the three months to Sept. Most companies in the group recorded weaker operating results amid a sluggish global economy. SIA’s operating profit fell 20% to S$79 million while SilkAir’s operating profit fell 20% to S$17 million. However, Scoot and Tiger Airways registered operating profits of S$5 million and S$3 million respectively from losses a year ago as the low-cost carriers continued to perform better on the back of an extended network and reduced operating expenditure. SIA Cargo recorded a loss of S$11 million while SIA Engineering’s operating profit fell 7.4% to S$25 million. In its forecast, SIA said the passenger airline business continues to be impacted by geopolitical uncertainty and weak global economic conditions. "Excess capacity and aggressive pricing continue to persist in the market, exerting pressure on loads and yields. The outlook for the cargo business also remained challenging as yields are expected to stay under pressure due to overcapacity in the air cargo industry," said the group. SIA is declaring an interim dividend of 9 cents to be paid on Nov 24. Shares of SIA closed 2 cents lower at S$10.11.